Like the Greek myth that inspired the title, Yorgos Lanthimos’ latest feature, The Killing of a Sacred Deer, concerns itself with the consequences of transgression and the meting out of justice. The film is being touted as a darkly comedic thriller, it presents a scenario that becomes increasingly, insidiously unnerving. 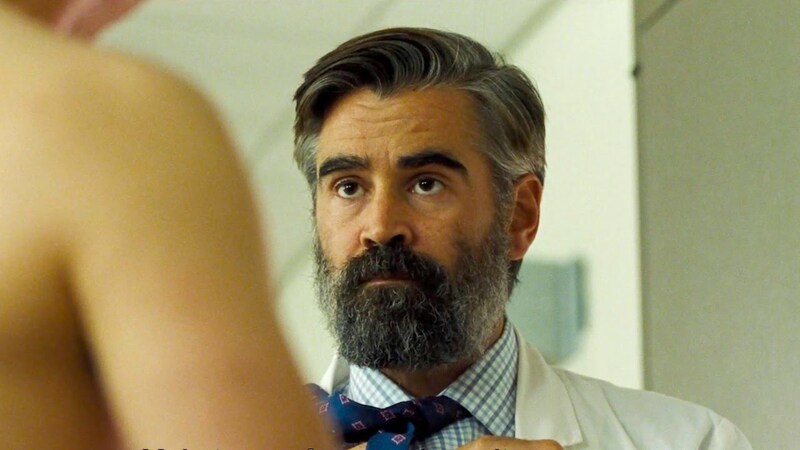 The plot concerns Dr. Steven Murphy (Colin Farrell) a respected cardiologist and surgeon. He has a stable, contented, successful life with an intelligent and attractive wife named Anna (Nicole Kidman), – a noted ophthalmologist. They have two children—15-year-old daughter Kim (Raffey Cassidy) and 12-year-old son Bob (Sunny Suljic). Surgeon Steven has befriended a 16-year-old boy named Martin (Barry Keoghan) whom he meets at a local diner, or down by the river, apparently just for a chat. Yet there is something unnatural about their relationship. Martin begins to turn up at inappropriate times in the hospital where Steven works or appears to hang around the car-park watching his comings and goings. The weirdness isn’t entirely on Martin’s side – when he shows up at the hospital for no reason, Steven lies and passes him off to his surprised colleagues as a classmate of his daughter’s. Steven gives Martin inappropriately expensive presents and then even invites him to his home in an affluent neighbourhood, so he can meet and socialize with his family. Martin becomes friends with Steven’s kids, and inveigles himself into the house by becoming a secret boyfriend to naïve teenager Kim. Martin returns the favour by inviting the surgeon to his humble home to have dinner with his single mom (Alicia Silverstone) and presses him to stay for the evening, soon leaving the adults alone together. Despite having met Steven’s wife and children, Martin expresses his approval of his mother’s attempted seduction. A dark undercurrent constantly runs alongside seemingly mundane events. Everyone is impeccably polite, although inappropriate questions or unsolicited confessions of personal details often puncture this veneer – it’s a discomforting method of establishing intimacy between characters and one which provokes awkward laughter. Lanthimos’s trademarks of deadpan dialogue and banal behaviour are utilized to create an atmosphere of mounting discomfort and oddly repressed sexual energy. It is revealed that Martin is the son of a man who died on Steven’s operating table a few years ago and it becomes clear that their relationship is based on guilt. Exactly what happened in the operating theatre on that day remains unclear. Lanthimos keeps all motivations vague. Then one day, Steven and Anna’s son Bob can’t get out of bed. His legs are paralyzed, and he is rushed to hospital by his panicked parents. Steven’s colleagues cannot find anything to explain the paralysis, physical and neurological test remain normal, but then Martin turns up in the hospital canteen and demands that Steven meet with him. There, to Steven’s incredulity, Martin matter-of-factly explains that it is, “that critical moment we both knew would come” – Karma has caught up with the doctor, and because he did not do what was right regarding Martin’s father, an innocent person must now pay the price. Steven must sacrifice one of his family to make amends, or suffer an even more terrible retribution. We have witnessed Martin’s disturbingly stalker-like behaviour and now we see Steven presented with a heart-breaking dilemma – we empathise with his tragic situation – but the truth is not so simple. We don’t yet have the whole story of Steven’s transgression. Along with Anna, we have to discover the full facts surrounding past mistakes. What follows creates several shifts in perspective. Despite Steven’s outward show of authority, assurance and success, he is a coward, refusing to take responsibility for his past actions, just as he now refuses to make the inescapable decision. Instead he remains in angry denial and retreats into violence, until he has no choice but to accept that Martin’s accusations are justified and his predictions are coming true. The scales of justice must be balanced. As in his previous film, The Lobster, Lanthimos uses metaphor to illuminate human nature and its failings. In The Killing of a Sacred Deer, working alongside his regular cinematographer Thimios Bakatakis and co-writer Efthimis Filippou, Lanthimos reveals his themes – Steven has played god, but the illusion of his patriarchal power is revealed as his wife makes alternate decisions and he is forced to pay for his hubris and denial. Within narrative twists Lanthimos plays with the conflict between science and the supernatural. Farrell and Kidman convey the sense of a subtext hidden in mundane language and action, and of a gradually building tension as their well-regulated world collapses. As Farrell has distanced himself from his earlier alpha-male roles, his performances have become increasingly interesting. The most striking character however, is Barry Keoghan’s unruffled and subtly unsettling portrayal of Martin – victim and villain. During the film we learn that one of the characters once wrote an essay on Iphigenia, the Greek myth that centres on the killing of a sacred deer by leader Agamemnon, and the terrible punishment for his transgression. Although Yorgos Lanthimos’s story takes place in a modern world of bright, clean hospitals and orderly, elegant homes, it has been pointed out that The Killing of a Sacred Deer might be seen as the latest film in a so-called ‘Greek Weird Wave’, which looks to the dramatic traditions of ancient Greece and tales of flawed characters confronted with impossible decisions and devastating choices. The Killing of a Sacred Deer is out on DVD & Blu-Ray!